The Genesis Pilot Lyophilizer is constructed with versatility in mind so that this freeze dryer can meet any lyophilization requirement. Shelf temperatures as low as -70C and condenser temperatures to -85C supports a wide range of applications. Available in bulk or stoppering configurations and with up to 6 shelves. Each system is available with a selection of control formats and temperature and vacuum sensors. 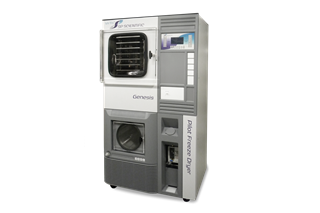 The Genesis allows you to configure a freeze dryer to meet your own particular application requirements.